New Skoda Rapid 2018 gets a new front end which is the main cosmetic change in this car. The front grille looks identical to the Octavia and Superb and now looks like part of the new Skoda family. The headlamps are sharp and they get projectors. They even have smoked effect to make it look sporty. The hood also gets a new design with changes in lines to match the new grille. A new front bumper and even a redesigned rear bumper are other changes. The tail lamps on the New Skoda Rapid 2017 have got a design tweak too. They continue with the C-shape look, however other aspects have been changed. Skoda is offering the new Rapid with both petrol and diesel engine options including the same 1.6-litre MPI petrol motor and the updated 1.5-litre TDI diesel engine. We drove the latter that now has a bigger turbocharger and produces 110 PS with 5 PS increase in power output. You can actually feel the strong performance and the way it pulls in the mid-range is super fun. There is some lag under 2000 RPM but post that it just picks up pace relentlessly until the redline. The Skoda Rapid 2018 mileage figures are pretty decent in both petrol and diesel fuel trims. The petrol manual and automatic variants deliver a mileage of 15.41 kmpl and 14.84 kmpl (both ARAI specified), respectively. The diesel variants with manual gearbox and automatic transmission return 21.13 kmpl and 21.72 kmpl (both ARAI specified), respectively. 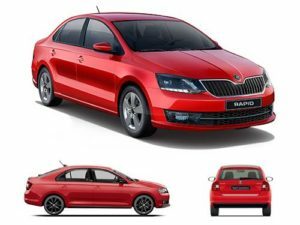 The Skoda Rapid was always a good car overall and with the facelift it has got much better in terms of appeal and performance. The new features are good but it still has to catch up with competition. The new diesel engine is a great performer. Ride and handling dynamics still remain one of the best in class. Overall, the new Rapid is now a much more desirable car to buy, however, it does come at a premium price.